I hope you all had a wonderful Christmas! Ours was perfect-how could it not be with these two?? If Aaron looks like he was "caught" in that picture, its because he was! 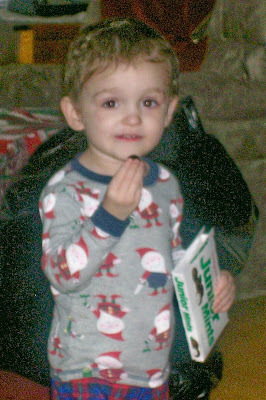 He took those Junior Mints out of MY stocking and ate a ton of them while I was in the kitchen getting his breakfast. Little stinker. Aaron got some great toys including a Thomas track that's as big as the kitchen table (what am I going to do with that??!!) and his Leapster that he just loves. He got a few clothes, books, and movies too. He's very spoiled. 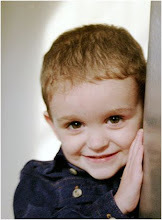 :) He also woke up one morning with a much higher IQ-he now knows all of his colors, shapes and most of the alphabet. I think I can have him reading when he's 3! I need to videotape him doing the ABC's, its too cute. 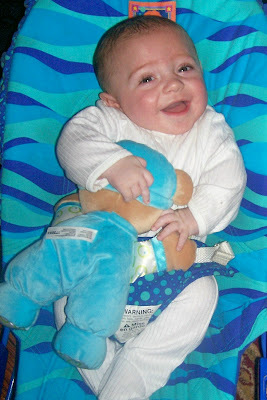 Its his "First Bear" and it rattles. He also has this cute little frog that sings and vibrates, but Aaron's been playing with that! How happy is this little man?? 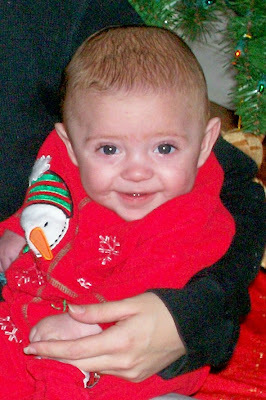 You can tell in the picture that he had a fever (stupid teeth) but he's just smiling away. I love him. Jamie and I didn't exchange gifts this year, which felt a little weird. :( My parents and grandparents did get Jamie some much-needed clothes though. And my mom got me the Paper Doll cart which I've been dying to use. We also got some gift cards for groceries, and lots of diapers and formula-we shouldn't need to buy anything for at least a month or two, which helps us out immensely. Aaron and Alex are SO CUTE! Oh my, I just want to pick Alex up and give him a squeeze! Look at those smiles!! Aaron! Taking mom's Junior Mints? Oh no!! Silly boy! (Pretty funny though!!) Becky, these photos are the BEST!! Sitting down and watching a movie uninterrupted? WOW! That's great too! It sounds like you had a wonderful Christmas!! Happy 2009! I just cannot believe the New Year is practically here!! Time passes by so quickly!! Take care!! Hugs!! Becky it sounds like you had a wonderful Christmas! I can't believe how big Alex and Aaron are getting. They are adorable! I hope Alex is feeling better. Hugs!